Hiring Activity - Season Shifts? The big story in the last report was hiring activity, specifically in Christchurch having been more subdued than previously. 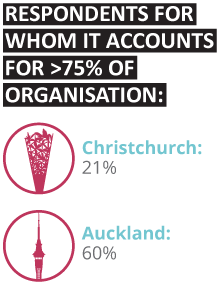 In April, just 57% of Christchurch-based IT organisations had recruited in the six months before. In this report, we’ve seen this pick up significantly, with 84.85% of Christchurch IT organisations stating that they have taken on new people in the last six months. However, we’re finding that this statistic tends to balance itself out, as while more organisations were recruiting in general, they were recruiting for fewer roles than in April, where nearly 30% of Christchurch’s IT employers had recruited for ten or more IT roles. This time around, that number was just over 15%, with 45.45% of employers recruiting for one or two IT roles, and a further 24.24% recruiting for three to five. We also saw this change reflected in Auckland. Despite an increase in the number of organisations that didn’t hire for any roles (which was predictable, as in the last report, 100% of respondents had recruited), most organisations only recruited for one to two IT roles, as opposed to last year when all respondents had recruited for three to five, or five to ten IT roles. In terms of hiring intentions for the next six months, results were much more divided. Christchurch employers were nearly 50/50 on whether they intended to recruit for an IT role in the next six months, with 51.61% of employers saying yes, and 48.39% saying no. Auckland employers sat at about 60/40, with 60% not intending to hire. Interestingly, we saw a shift in the reasons driving recruitment from what we’ve been seeing over the last few reports. In the last 12 months, new work and projects have always been the main reason that employers are looking to engage new talent. This time around, increased demand of IT from within the organisation emerged as the most frequently cited reason that organisations were looking to recruit an IT candidate in the coming six months. While new work and projects still featured prominently, it dropped off significantly from our April results, with replacement of staff not far behind. This could be due to the next six months being the time of the year where most new projects have moved through the planning and approval processes, and become more about delivery, with recruitment already complete. However, there’s something to be said for the number of tech developments happening in the business world at large; we’re seeing a number of organisations undertaking or completing internal transformation initiatives, which would equire more of internal IT functions. Over the years of conducting the Sourced Report, one of the aspects that we’ve seen the least change in is employee priorities. Survey after survey, the same few aspects of working life emerge as of importance to employees. Invariably, these are a combination of work/life balance, challenge in the workplace, support from management, access to good technology, a clear pathway for career opportunities and professional development, and flexibility in the way that they work. Regardless of the demographic, whether you look at age or gender, most respondents’ core priorities revolve around these elements. There are also a number of interesting trends around this, for example, the fact that financial incentives almost always feature as less important than aspects of the role that are related to the work itself. Another example is that flexibility, and other benefits that enable work/life balance, are valued higher than perks like car allowances or stock options. regard to the importance of salary. Judging from the responses to our survey, whilst salary is still seen as important, it’s important in that it’s a basic need to sustain themselves, rather than a consistent motivator in the workplace. It’s easy to assume that because of the emphasis from respondents on intrinsic motivators that most people are fairly content in their roles. However, when asking employees how long they intended to stay in their role for, 38.16% of Christchurch respondents stated that they were currently looking for a new role. It must be acknowledged that our results could be somewhat skewed due to our status as a recruitment agency potentially attracting more respondents who would be looking for work. role, nearly a quarter less than the average. This means that of those who weren’t receiving flexibility, 46.32% stated that they were currently looking for a new role – nearly half. In Auckland, we actually saw a decrease in those looking for a new role, falling to 31.67% - though that’s still a significant portion. However, we saw flexibility have a similar effect here, with the number falling to 22.22% if flexibility was received. 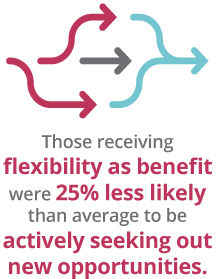 41.12% of those who were not receiving flexibility as a benefit stated that they were currently looking for a new role. these initiatives can be implemented. 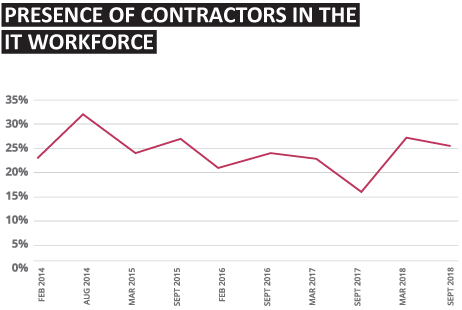 While the proportion of Christchurch IT professionals working as contractors has remained relatively static over the previous six months, there has been a strong bounce-back in the last year, with contractor numbers returning to the higher levels last seen in 2015. If employers do not recognise their people’s desire for flexibility in their work and provide avenues for this, then we would expect this number to increase. coming out of Auckland, and reinforces its reputation as an area for small tech businesses to flourish – though there significant competition. encompassing many of the smaller companies that are entirely tech focused. Thank you, once again, to everybody who participated in the survey and contributed to this edition of the Sourced Report. The last six months have seen some interesting trends continue in the Christchurch and Auckland IT sectors, and we’re excited to see how they develop heading into 2019 and beyond. value, and why they value those things, in particular around work/ life balance. Flexibility really came to the fore in this report, and we expect this to be a key trend long-term, with more businesses recognising its importance to retention and making strides in this direction. 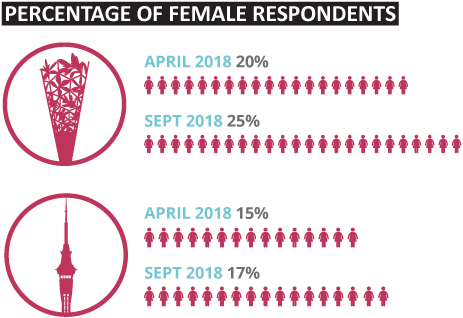 In other news, we also saw a steady increase in the number of women who participated in this survey, which is great news. We’re excited to see that increase further ahead of our next report, where we’ll revisit the data we’ve collected on gender for a year-onyear comparison beside our last report.